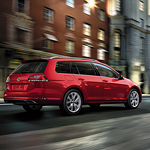 To complete the driving experience, the Golf SportsWagen has a 12-way power driver's seat. With just a push of a button, you can easily find your personal driving position. Add their special lumbar support, and you'll be ready for whatever the road brings. You can't get the full experience until you take one of these popular sport utility vehicles for a test drive. We'd love to see you at Brunswick Auto Mart.